ALLEGRA BOVERMAN/Staff photo. Gloucester Daily Times. 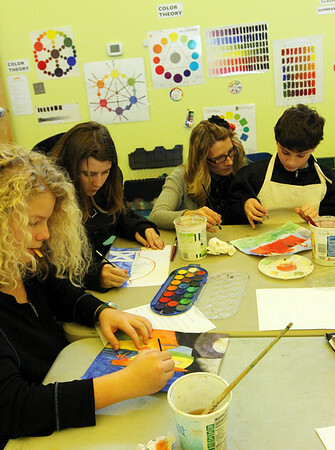 Gloucester: Shay Cajolet, the director of arts integration, center, works with Ryan Parisi, a sixth grader, right, in the visual arts class at the Gloucester Community Arts Charter School on Tuesday. The lawsuit against the state and the school was summarily dismissed. At left, from left, are seventh graders Laney Lavelle, and Shannon Kelly.